Visitors to the Curragh Military Museum can now see the historic vehicle Slíabh na mBan, which was used by Michael Collins on his last fateful journey. It is housed in its own separate annex and visitors should check with the Museum to see if the annex is open on the day of their visit. The Military Heritage of Ireland Trust CLG is pleased to announce the creation of a link to a new website that will act as a forum for everyone interested in the Irish participation in World War 1.
http://www.irelandww1.org/index.php has been created by Richard Grayson and Catríona Pennell who now co-edit the site. They have both been involved in a number of events which have flagged the amount of work going on around centenary celebrations. During these discussions, they have become aware that there are many connections which could be made between academics and community groups, but which have not yet been made. Richard and Catríona want to do something about this, and believe that a website which acts as an information hub could be useful for academics and community groups. They would like to collate information about whatever is happening in relation to the subject of Ireland in the era of the First World War. That could be current or future: research projects, doctorates, post-docs, exhibitions, public talks, workshops, publications, guided tours, political debates/discussions, documentaries, art, theatre…the list is endless. As well as being an information hub, Richard and Catríona hope that the website will also act as a networking forum, allowing academics and representatives of non-university-led organizations and projects to introduce themselves to each other, and perhaps act as a springboard for conversation and collaboration. Most of the cards contain information about campaign medals, which were generally awarded to all those who served overseas. However, some of the cards record people’s entitlement to gallantry and long service awards. It is important that as much information is sought from family records; for example – name of regiment or branch (infantry, artillery, cavalry etc), rank, service number etc. In addition, the correct spelling of the first name and family name should be accurate. The National Museum of Ireland – Decorative Arts and History will hold a special day of talks to showcase new research on the theme of ‘Visual and Material Culture’ at the National Museum of Ireland, Decorative Arts and History, Collins Barracks on Saturday 16th February 2013. The purpose of the conference is to allow historians, scholars and practising artists to present their work for discussion before established academics, researchers and peers working the fields of visual and material culture today, as well as members of the general public interested in these areas. Papers on any aspect of the National Museum of Ireland’s decorative arts and history collections are welcome. Individual papers should last for 20 minutes and anyone interested in presenting their work should submit a short Curriculum Vita, along with an abstract of no more than 300 words to the address below before the 1 December 2012. “Our Archives are essential in the preservation of primary sources for study by future generations. This launch is the culmination of years of work by the Military and National Archives. The records held within this collection cover almost the entire duration of the Decade of Commemorations, providing primary source material for the revolutionary period in Ireland from 1913 to 1921. “The Bureau of Military History website will make a significant contribution to the goals of the Decade of Commemorations by encouraging scholarly and original research on the momentous events of this period in our history both nationally and internationally. In funding and developing this project, the State is paying tribute to the sacrifices of the past and celebrating the achievements of a revolutionary decade. “The Military Bureau’s official brief was ‘to assemble and co-ordinate material to form the basis for the compilation of the history of the movement for Independence from the formation of the Irish Volunteers on 25th November 1913, to the 11th July 1921’. Anyone who sees these collections online will have to agree that they accomplished this goal with distinction. 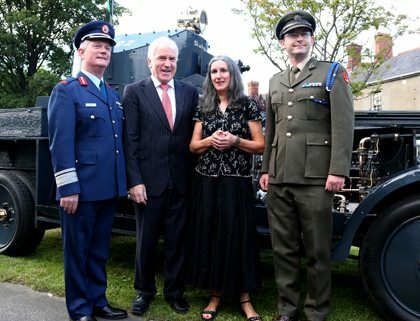 Maj. Gen. Ralph James (DCOS Ops), Minister Deenihan, Ms. Caitriona Crowe (National Military Archives) and Comdt. Padraig Kennedy (OIC Archives) in front of AAR 2 ‘Sliabh na mBan’ (the ‘Michael Collins armoured car)..
“As the use of the internet at home continues to grow as the medium of choice for research, this project will bring these records to a whole new audience, and will greatly enhance understanding and appreciation of the sacrifice made during these formative years of our state“. The Bureau of Military History Collection (BMH) is among the most important primary sources of information in Irish History from 1913-1921 available anywhere in the world. The project was undertaken by the Defence Forces Military Archives, in collaboration with the National Archives and was largely funded through the Dept of Heritage, Arts and the Gaeltacht. The collection involved the digitisation of over 35,000 pages of witness statements and contemporary documents, 400 photographs and 13 voice recordings from primary sources covering the revolutionary period in Ireland from 1913 to 1921. This documentary evidence was collected by the State between 1947 and 1957 ‘to assemble and co-ordinate material to form the basis for the compilation of the history of the movement for Independence from the formation of the Irish Volunteers on 25th November 1913, to the 11th July 1921’ (report of the Director, 1957). The Bureau was stored for decades in the Department of An Taoiseach after the last statement was collected but in 2001, it was decided to transfer the Bureau to Military Archives and prepare it for release into the public domain. Now the website, www.bureauofmilitaryhistory.ie, allows people from all over the world unprecedented online access to these eye witness accounts for the first time. “As we got out the door into Henry Street, we lined up ‘two deep’ with the O’Rahilly standing in front and Patrick Pearse by his side… Our gallant attempt to break through failed and the survivors ended in an old burnt out ruin in Moore Street. I saw O’Rahilly fall wounded and my nearest comrade, Pat O’Conor, was killed just in front of me and falling on me pinned me under him” (BMH/WS 153, p.5). “When the Black and Tans behaved in such an excited and unsoldierly way by endangering my daughter’s life when she was playing in St. Stephen’s Green, I resolved to give all the help in my power to the resistance movement headed by Michael Collins. … I also gave him [Batt O’Connor] a latch key of my house, 15 Ely Place, and prepared that apparently impassable cul de sac so that Collins, if hard pressed, could use my garden and appear in St. Stephen’s Green.” (BMH/WS 700).